Sign in to your WordPress backend. Open the tab Plugins and activate the plugin “WooCommerce Amazon Pay Gateway” by clicking “Activate”, as shown below. Under WooCommerce ›› Settings, select Checkout ›› Amazon Pay & Login with Amazon and enter your Amazon Pay keys and IDs in the relevant fields. 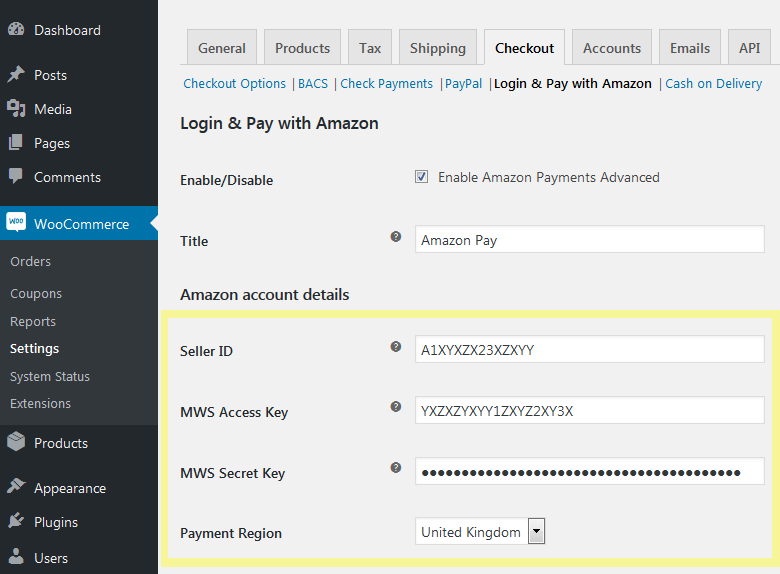 Please find all necessary credentials in your Amazon Pay merchant account in Seller Central under Integration ›› MWS Access Key. Choose the region where you registered your Amazon Payments merchant account. Tick this box to activate Amazon Pay in your web shop. Untick this box to enable your customers to use Amazon Pay. Please select “Authorize the payment when the order is placed”. Save the configuration. Amazon Pay is now available in your web shop.